Recognized as an established, Taiwan-based supplier and manufacturer in the industry, WON JEE PLASTIC MACHINERY CO., LTD. has been offering its customers quality plastic extruder, plastic recycling & pipe extrusion machine, and PP since 1978. With both advanced technology and professionalism, the supplier is sure to meet each customer's demand. Won Jee offers Pipe Extrusion Machine normally designed for PVC, HDPE pipe extruding tasks that comes in two variation, double pipe and single screw extruder. Depending on the output that you are expecting to see at the end of the day, both pipe extrusion machines offer excellent extrusion result. Won Jee offers a R&D team that provides any after sale customer care and maintenances that ensures the productivity runs smoothly for your company. 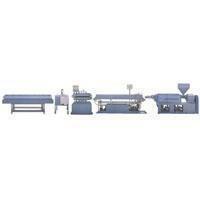 Won Jee Plastic Machinery is a company dedicated to provide plastic solutions. Established in 1978, Won Jee has since then been offering services and providing many industries with machineries that resolve plastic wastes. Most notably known for manufacturing excellent pipe extrusion machine, plastic recycling and extrusion machines, Won Jee has been living up to its reputation as one of the top leading supplier in the industry. The pipe extrusion machine will bring you high production output and low investment costs; consider Won Jee Plastic Machinery to be your optimum choice. Our machines can be custom made to your needs. Contact us we and will be happy to provide you with an estimate on your orders. The extruder machines are built with Japan imported components, and are being exported globally. Space occupied by one set HDPE / Dual-hole Barrels equipment is less than that occupied by two sets HDPE / Single-hole Barrel equipments. One set HDPE/ Dual-hole barrels equipments output is high , it can extrude Dual-hole Barrels product.